CSA Begins June 7 & Shares Still Available! Sooner or later the rain will stop, right? The peas will inch up their waiting trellises, the carrots will be more than orange threads and the dahlias will burst above the soil surface. No one knows better than the farmers what an UNUSUAL spring this has been. 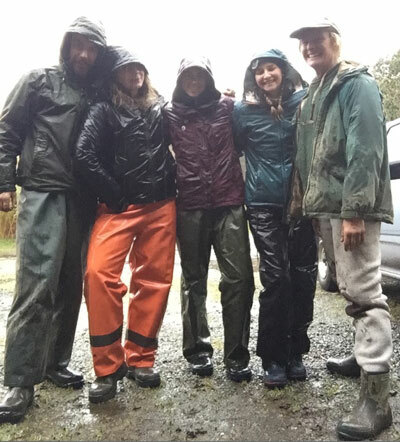 The intrepid interns and I have been suiting up in our raingear and heading out into the fields in anticipation of the start of the CSA on June 7th. Surely there will be bounty by then. Lots of vibrant green goodness! 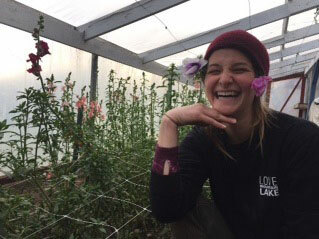 We’d love to have you join us for another season of Community Supported Agriculture. Your subscription keeps our little farm chugging along. Or, if you’re ready for an early season infusion of freshness, come on by our booth at the Bainbridge Island Farmer’s Market on Saturdays between 9-1. There you can pay by cash, check or credit card and take advantage of the 10% subscriber discount. 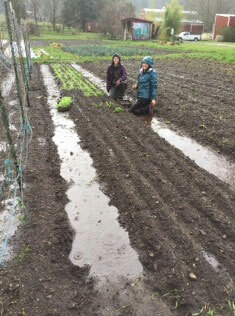 Rebecca and the interns brave the soggy spring weather. We’d love to see you and introduce you to the wonderful new team of aspiring young farmers: Sean, Amanda, Chelsea and Mackenzie, all hailing from points East. You can do me a favor and assure them that, yes, it does eventually warm up and become beautiful in the Pacific Northwest. I think they’re starting to worry the gray skies will never lift and our boots will remain permanently attached to our feet. New this season are some gloriously beautiful new flower varieties, the return of our cherished French Pink garlic, English shelling peas, several hefty heirloom tomatoes we’ve never grown before and the installation of a new well! Please tell your friends about Persephone. Your referrals will be rewarded with an extra box of veggies. And our heartfelt gratitude.